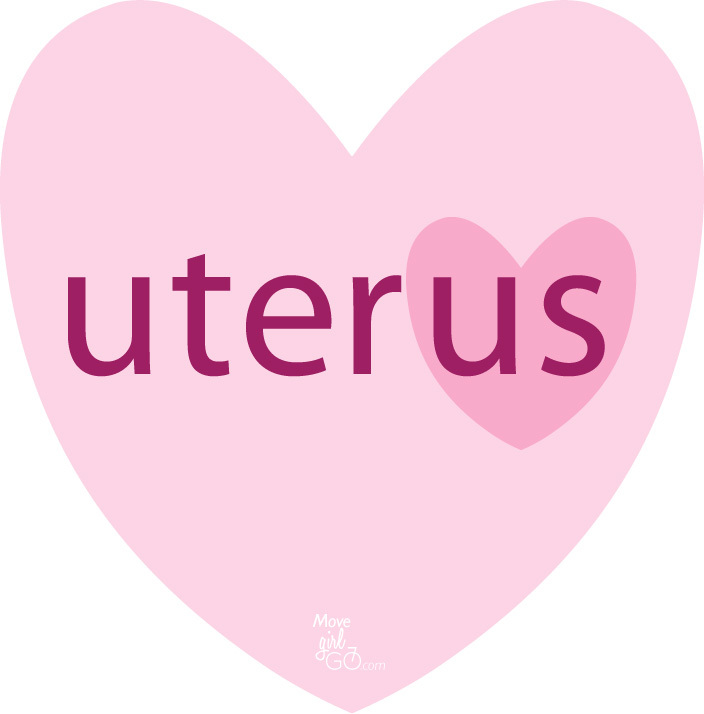 Join in for some Uterus love. We all know how to keep our muscles healthy with exercise, but how bout our unseen organs? They work undirected and unnoticed until there’s a hitch in their giddyup. This week we are each focusing on the health of one organ, and today it’s the lovely uterus. This rather special female-only component is a muscular organ capable of – well, you know what it can do: cramps, PMS, chocolate binges, glass ceiling breaker, and hidey-hole for developing miniature people. Let’s burrow in shall we? Oh marvelous creature, wake up and get cracking! Plug in those earpieces and run some early sun-filled miles, sweat out toxins and hydrate the cells. Back home, a mite pleased with herself, she enjoys a cup of tea, rich in flavonoids that help prevent uterus cells from running amok into dangerous cancer-territory. Before heading out she peels and enjoys a grapefruit that helps balance hormone levels of progesterone and estrogen. And she loves a hot breakfast of organic oatmeal, barley and flaxseed for their high-fiber, which can eliminate excessive estrogen and keep her going. How’s the work life of our tenacious girl? Whether surrounded by many an ignoramus or hitting the jackpot with creative and humorous folks, our uterusetarian heroine looks to bright spots in her day. She knows to get her 15 minutes of sun on a break – just to soak in Vitamin D to help prevent uterine fibroids. And unlike Icarus, she knows to limit her exposure. For her lunch on a park bench she’s prepared a green green green kale and spinach salad with tomatoes, sprouts, mushrooms, celery, black beans and colorful peppers – all helping to improve blood flow and maintain an alkaline level in her uterus. On her way home after work our girl has scheduled a needle-filled treat with her acupuncturist as it’s a practice known to improve blood circulation, and if our girl were inclined, to help with fertility. A quick stop at the grocery store for her dinner fixings, and in her cart go brown rice to build her blood, broccoli and carrots for their flavonoids, and wild salmon for a kick of protein and flavor. In the checkout line our curvaceous girl knows to ignore celebrity-rags with their vacuous waifs showing off their rib-cage bone structure while touting their eponymous line of schlock. After her delicious dinner our uterusetarian heads out to join her fabulous uterus-wielding friends to deconstruct their day, get lively and rambunctious all while simultaneously getting rid of stress and anxiety. At the end of her uterus-loving day our girl sends up her small wish that ever-querulous folk be made silent, for the villainous-minded to be brought to justice, and for the precious few, we 3,562,760,737 women strong to leave the naysayers behind while we become notorious for our healthy and loving uterusetarian society. It’s a do-able wish, right?